As we trust you’re aware, one of our top priorities and responsibilities as elders is to enable the health and longevity of our ministry staff. With this in mind, some time ago we initiated a series of conversations with Justin, our preaching minister, about scheduling a sabbatical--a period of paid leave granted for the purpose of rest, enrichment, and rejuvenation. Justin welcomed this idea and we’ve collaboratively scheduled it for summer of 2019. Many ministers and churches are unable to prioritize or don't fully appreciate the need for sustained and continual spiritual renewal of ministers. In particular, preaching ministry (and all that it includes in Justin’s case--counseling, leading the staff, evangelism, being a resource to the elders, etc.) is a unique job that requires creativity, wisdom, energy, perspective, and spiritual health. Because of these unique requirements, burnout is recognized as a common reality among ministers. Thankfully, this is not the case here. Justin is in a place where he is healthy, his marriage and family relationships are strong, his working relationship with the elders is excellent, and his ministry at RRCOC is vibrant. We’d like to invest in the continuation of that reality. To that end, we’ve scheduled for Justin a 10 week sabbatical leave in the summer of 2019. Sabbaticals have long been a recognized way to prevent burnout. This will be a time during which he can disengage from his regular tasks at RRCOC and spend time away to engage in the pursuit of spiritual renewal, rest and reflection, renewed vision, focused study and prayer, and anything else that may enable continued spiritual, emotional, mental, and physical health. Because you may not be familiar with this practice, we want to provide answers to any questions you may have. Below are some questions we’ve anticipated, but please don’t hesitate to reach out to the elders (elders@rrcoc.org) if you have any questions we haven’t covered. Thank you for being a church that supports the health of its minister this way. Please join us in praying that this time would be life-giving for Justin, his family, and our entire church. Yes! Very much so. Justin’s thriving and we couldn’t be more grateful for the way he serves and leads our church. We initiated this idea because we want things to continue to be great. The goal is spiritual, professional, and personal renewal. Since the work of preaching ministry requires huge amounts of creativity, wisdom, energy, perspective, and spiritual health, we want to provide this time away from day-in-day-out tasks and weekly preaching for Justin to reflect, explore, and recharge so that he can re-enter his ministry with renewed vision, energy, and spiritual vitality. We think of this practice of periodic extended sabbath like a healthy diet or exercise--an essential part of sustained wellness. When is this, how long will it last, and how did you decide the length? It will happen during the summer of 2019 and last for 10 weeks. In addition to our own thoughts, we sought counsel from other ministers and leaders on a good length to feed a long term renewal. Will Justin get paid during this time? Will Justin still be around, but just not preach? Justin will be in town during parts of his sabbatical, but will not be in the office any of this time. Nor is there any expectation from us for Justin to worship with us on Sundays (and he likely won't be). This will enable him to fully disengage and focus his attention on things other than his work at RRCOC. We will make sure his normal responsibilities are covered by the rest of the staff so that nothing is neglected. We’re already working with Justin to line up a handful of individuals from outside our church to preach during his absence. Whoever we utilize, our goals are to provide the church with great preaching that’s engaging, helpful, and Spirit-led. Will we have a preaching intern during this time? No. Since Justin will not be able to offer supervision and mentoring to an intern next summer, we will not have another preaching intern until 2020. The preaching during this sabbatical will be done by experienced speakers. Is this the plan for all the ministers? At this time, we don't have plans to pursue a sabbatical for our part-time ministers. We feel their flexible schedule provides the necessary time for the continual spiritual renewal needed. For our other full-time ministers, when their tenure is longer, we will consider the possibility of some form of sabbatical, but nothing will be decided until then. We initiated this practice with Justin due to the length of his tenure at RRCOC (8 years; 9 at the time of sabbatical) and the unique demands of preaching ministry. Will Justin receive a sabbatical every 9 years? After this sabbatical, we’ll evaluate it with Justin and decide what makes sense for the future. Is this just an extended vacation? 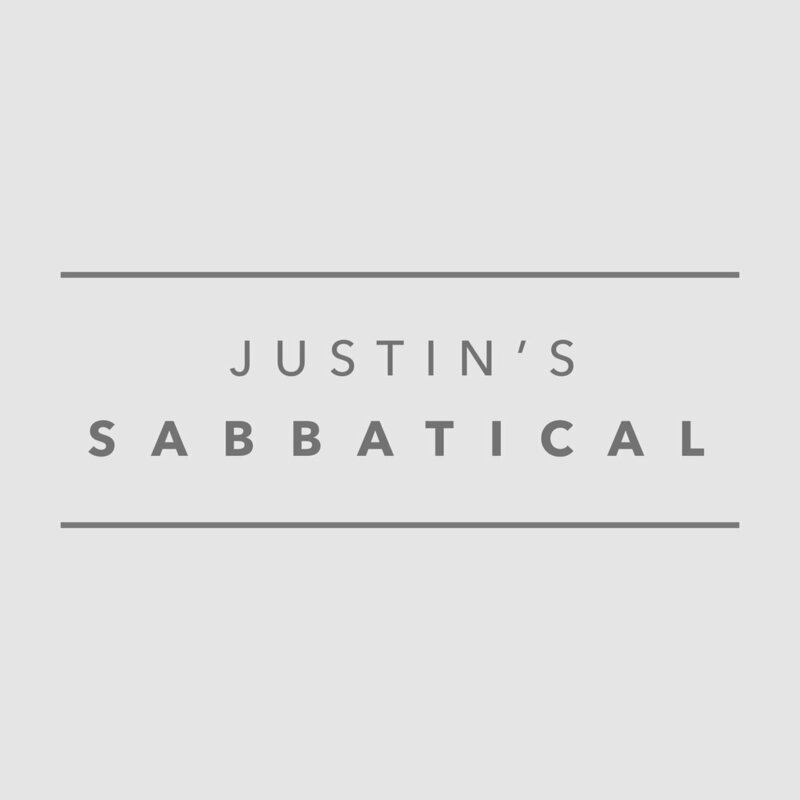 What will Justin do during the sabbatical? Although there will be time off in a traditional sense of a vacation, the purpose and thus activities associated with a sabbatical are largely different and centered around spiritual and professional enrichment. Justin will engage in a variety of pursuits that enliven him, with a focus on exploration, learning, rest, and spiritual disciplines. These will include reading, spiritual retreat, conversations with others in ministry, worshipping with other churches, travel, etc. What about Jennifer (Justin’s wife, who’s also on staff)? Will she still work? Yes--the plan is for Jennifer to continue in her work as Storytelling Minister during Justin’s sabbatical. If, however, it seems best for her to pull back during some or all of this time as well, her time away will be unpaid and we’ll work to ensure that key aspects of the Storytelling Ministry continue in her temporary absence. How did we decide on summer for Justin's sabbatical? We felt along with Justin that it would be the least impact on the staff and church to be absent during the summer since our families are so active with camps, mission trips, vacations, etc. Wait...will Justin be out looking for a different job? Why are we talking about this so early? Since this is a new practice for RRCOC, we wanted to communicate about it early so there’s plenty of time to make sure everyone is in the loop and has an understanding of what this is and why we’re doing it. I don’t get a sabbatical at work--must be nice. Oops--that’s not a question. :) But your point is taken. It is nice! At least that’s our aim. We have every desire to make working at RRCOC a deep blessing. The elders (and Justin, as he leads the staff) strive to make sure we don’t just see our staff as employees, but people--followers of Jesus (and members of God’s family here) whose spiritual, mental, emotional, physical, and family health we value and foster in every possible way. Our goal is not to simply mimic practices in the marketplace, but to do even better. We’re confident this is part of us leading Justin well as he serves as our preaching minister.